I come to you with tidings of tea and holiday reads! 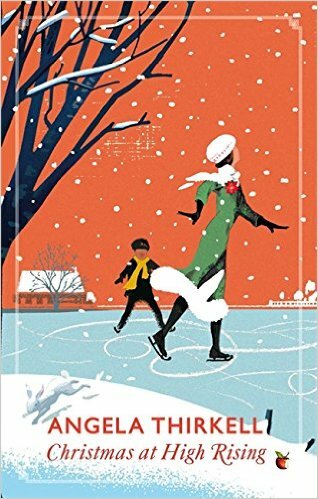 Christmas with the Savages, by Mary Clive: Seen through the eyes of a prim little eight-year-old, and based on real events and people, this novel perfectly recaptures a Christmas holiday of 100 years ago, and is effortlessly funny. This delightful story, first published in 1955, brings to mind a “Downton Abbey” Christmas, only from the perspective of the nursery children. It’s episodic, lighthearted, and lots of fun! I purchased a used hardcover, but there’s a very pretty paperback available from Amazon and other places. The Night Before the Night Before Christmas, by Richard Scary: It’s the night before the night before Christmas, and Mr. Frumble wants to be helpful. When he stumbles into Santa Bear’s workshop and mixes up the dates, everyone thinks it’s the night before Christmas! Santa dashes off to deliver the presents, but then gets stuck in Mr. Frumble’s chimney! Find out how Mr. Frumble saves the day in this funny, topsy-turvy Christmas story. I adored Richard Scarry as a kid and loved reading the books to my little siblings later on. I’m not sure how much Scarry actually had to do with this book considering when he died, but the characters are familiar and the story will entertain your young ones. This is just perfect for the holidays, particularly if you’re in the mood for a heart-fluttering yet chaste Victorian romance. The author is well-versed in the era, having published various non-fiction books and scholarly articles. Bottom line: this novella is fun, romantic, and free of cringe-worthy anachronisms. I’m right in the middle of this story and enjoying it even more than I’d expected. Samantha Silva brings to life the people and places of Victorian London and makes Dickens appealing even as she draws attention to his personal failings. It’s quite an absorbing read. I made my usual ginger cookies and frosted sugar cookies, but perhaps you notice another item on the plate above. Yes, it’s a mince pie! Steve and I love indulging in these when we’re in England over Christmas, but they’re not ubiquitous here in the States. One year I made crusts from scratch and filled them with mincemeat I’d purchased at Chatsworth. This year, however, I found orange & cranberry mince pies from Walkers on Amazon! All you need do is warm them up in the oven (one at a time or all at once), and voila! Scrumptious. As for the tea blend, I learned of Chado Tea’s Noel while reading the Holiday issue of Teatime Magazine. If you like black tea blended with cinnamon, orange zest, vanilla and almond, you’ll no doubt find this tea delicious and festive. Check out all the offerings from Chado Tea here. ***Remember that you can click the Christmas tag below for past recommendations for holiday reading, drinking, and eating! What are you reading/brewing/baking for the holidays this year? I do love recommendations! This entry was posted in Reading, Tea and tagged books, Christmas, holiday, reading, recommendations, tea, tea and a book on December 12, 2018 by SoniaG. This quirky Christmas tale would make for a great bedtime read-aloud, but it’s also perfectly appropriate for independent readers 8 and up. One might even pair it with J.R.R. Tolkien’s Letters from Father Christmas. The very wealthy Edgar Downes has promised his aging father to finally take a bride—specifically, to wed a titled lady by Christmas. London is full of pretty, proper, and eligible misses, but it’s the widow Helena, Lady Stapleton, in a shocking red dress, who captures Edgar’s attention. Helena is intrigued by the seductive stranger—but he’s simply not in her class. Marriage, of course, would never do. But in a season of miracles, something wondrous is about to happen. I stumbled across this title in a 2012 Publisher’s Weekly article recommending holiday romance and was drawn in from the first paragraph. I rather assumed it would be a gentle romance, but it turned out to be quite spicy! (Not in an overwhelming or distasteful way, in my opinion.) The love story still manages to be sweet and cozy, particularly when the cast of characters moves to a snowy country house setting for (Regency appropriate) Christmas festivities. Note–if you order this edition, you get a bonus Christmas novel! Note–I listened to the audio, but I recommend reading the actual book, especially if you’re American. Jilly Bond gives a solid performance for her English characters, but her American accents are pretty terrible. Novel Novice’s Five New Holiday Picture Books to Gift and Enjoy and Best Books for Holiday Gifts 2017. 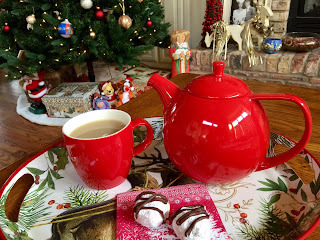 Also, if you click the “Christmas” tag below or in the sidebar you’ll find book reviews, recipes, and tea recommendations going back several years on this blog. This entry was posted in Reading and tagged books, Christmas, holiday, reading on December 15, 2017 by SoniaG. Goodreads synopsis: Miss Quinn, who cherishes her privacy, intends to spend Christmas on her own as she likes it. But before the holiday, her brother telephones to tell her that his wife has been rushed to the hospital, and would Miss Quinn come and stay with the children? Miss Quinn’s unexpectedly hectic Christmas has a significant effect upon her life. My thoughts: My mom has always loved the novels of Miss Read (a.k.a. Dora Jessie Saint, who died in 2012 at the age of 98). I read one or two of them when I was young, but at that time I didn’t have quite such a powerful craving for quiet and cozy books. Well, I do now! And amidst all the madness of late, this book certainly hit the spot. I thoroughly empathized with Miriam Quinn’s preference for quiet and solitude. At the same time, it was great fun to see her thrown in with her brother’s somewhat feral brood of children. Oh, the appalling disorder! How satisfying to watch her organize them, and then how delightful to see her loosen up and enjoy various sweet moments of connection with each child. My favorite part involved the two nieces, one of whom knows “the truth” about Father Christmas and is aching to spoil her younger sister. Our Miriam deals with that in a lovely way. No Holly for Miss Quinn is a quick read brimming with warmth and humor, and even a tiny bit of romance. Chime in if you’ve read it — I’d love to hear about your favorite moments! I particularly enjoyed the illustrations by J.S. Goodall, which gave me the same cozy feeling as those of Garth Williams (the Little House books) and Pauline Baynes (the Narnia books). LOOK AT THIS! I have listened to this Enya CD about a million times, and I never once associated this song with Miss Read. How delightful! Do have a listen. 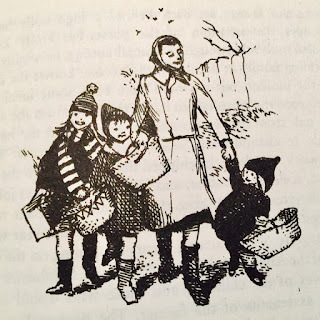 Miss Read/Dora Saint wrote of her own childhood in Fortunate Grandchild and Time Remembered (now combined in a single volume entitled Early Days). Also, for more on her inspiration for the novels’ settings, see On the Trail of Thrush Green. Here is a closer view of the “snowballs”. In the pot is Thé des Délices, a black tea containing citrus peel, candied mandarins, and cocoa nibs. So delicious, and only available during the holidays from Palais des Thés. Don’t forget to check out my December Holiday Reading List, and do let me know if I’ve left out one of your favorites. HAPPY HOLIDAYS! This entry was posted in Reading and tagged Christmas, reading, recipes, tea, tea and a book on December 15, 2016 by SoniaG. Friday Favorites: Holiday reading list! Burning Bright: Four Chanukah Love Stories, by Megan Hart et al. Next week I’ll feature one of the novels listed above for my December “Tea and a Book” post, so stay tuned! This entry was posted in Reading and tagged Christmas, friday favorites, Hanukkah, holiday, Kwanzaa, lists, reading on December 9, 2016 by SoniaG. You know me — during this season I love to listen to Christmas music, watch Hallmark Christmas movies, and read Christmas-themed fiction. I have four books to recommend, two of which were intended for children (tho they certainly have appeal for adults, as well). The Children of Green Knowe (1954), by Lucy Boston. Young Tolly is sent to stay with his great-grandmother over Christmas and soon learns that the looming, castle-like house is haunted (!!!). But these child ghosts are long-dead family members, and over the course of the story Tolly learns what happened to them, and eventually must face a dark force that threatens the house. 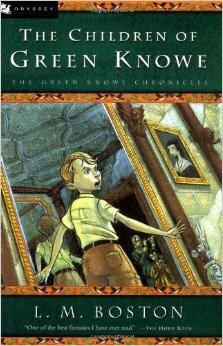 There are more Green Knowe books, and I love the fact that the house is based on a real medieval manor in Cambridgeshire owned and restored by Lucy Boston herself. (It’s open to visitors by appointment!) I highly recommend the audiobook with its lovely voice performance from Simon Vance. 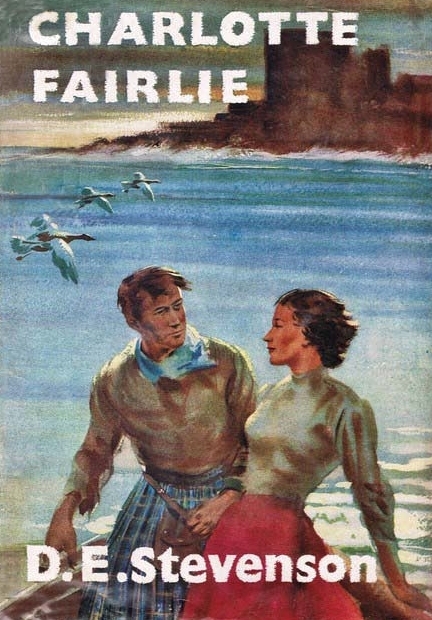 Charlotte Fairlie (1954), by D.E. Stevenson (also known as The Enchanted Isle). Ever since enjoying Miss Buncle’s Book, I’ve sought out all the Stevenson books I can find, and this one, with its headmistress heroine who visits a pupil’s family castle in remote Scotland, certainly seemed right up my alley! The book is very difficult to find in print, but luckily there is a satisfying and readily available audiobook from Audible.com. I suppose it’s a bit of a cheat to include this one–the Christmas bit only comes in toward the end and seems a bit “tacked on”–but it’s a beautiful season for bringing everyone together. The romantic impediment strains credulity, but I didn’t care! I just enjoyed spending time with these people. Christmas at High Rising (a collection of stories published in the 30s & 40s), by Angela Thirkell. 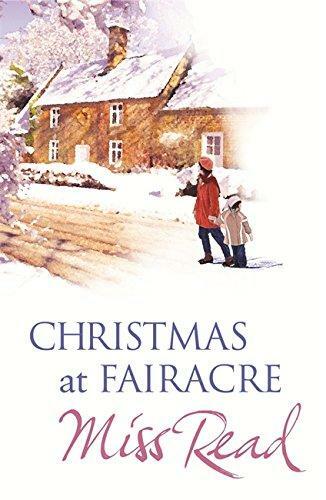 Only two of the short stories in this collection have anything to do with Christmas, but I especially liked seeing Laura Morland and her son Tony during the holiday season. I also enjoyed the story from Thirkell’s own childhood experience of celebrating Christmas at the house of her grandfather, Edward Burne-Jones! If you’re interested in reading this anthology, I recommend first reading Thirkell’s High Rising, which is linked below (and is set almost entirely during the Christmas/New Year season). 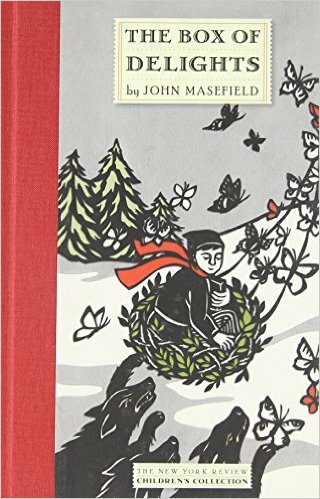 Box of Delights (1935), by John Masefield. Having left boarding school for the Christmas holiday, young Kay Harker comes into possession of a magic box, which he must use to thwart a gang with evil intentions. This story brought to mind many favorites: C.S. Lewis’ Narnia books, Edward Eager’s Magic series, and Susan Cooper’s Dark is Rising series. (I wonder if Masefield was as influenced by E. Nesbit as Lewis, Eager, and Cooper were?) The story has been adapted into several BBC radio shows over the years, and also has a 1984 BBC TV adaptation that I’d love to get my hands on (though I shudder to think of the special effects). It’s available in a lovely New York Review Children’s Litarature edition (see link above) or on audiobook. My favorite thing about Box of Delights is the character Maria, a very young girl who talks tough and acts even tougher, and no one in the book ever asks her to behave like a lady or any of that rot–so refreshing in a book written so long ago! All in all, the story is not quite as magical as those of Lewis, Eager, or Cooper, but it is unique and charming, and from it I finally learned how to make a posset: fill a bowl with hot milk, an egg, a spoonful of treacle, a grating of nutmeg, “and you stir ’em well up, and you get into bed and then you take ’em down hot.” Supposed to revive the weary! How about you? Any Christmas reads to recommend? This entry was posted in Reading and tagged Christmas, friday favorites, holiday, reading on December 11, 2015 by SoniaG. Source: Bronte BlogPublished on 2019-04-18By M.